Yamaha is upping the ante in its all-in-one soundbar lineup with the announcement of the new YAS-106 soundbar geared towards home theater aficionados. The new soundbar replaces the YAS-105 and is for people who want multichannel audio performance without lots of speakers or speaker wiring in their listening environment. Yamaha points out that in contrast to its predecessor, the YAS-106 offers more simplified setup and operation. The YAS-106 also sports a new, more rounded, ultra-slim design that Yamaha says has better cosmetic appeal and offers greater placement flexibility. The YAS-106 stands at only 2 1/8 inches tall and is 35 inches wide. The YAS-106 is designed to simulate a virtual surround sound experience from 5.1 or 7.1 Dolby Digital and DTS soundtracks. The effectiveness of simulated surround sound, however, will depend on your room’s layout. The new soundbar does not support immersive audio formats such as Dolby Atmos or DTS:X. Users will need to take a major step up to YAS-5600 for those features. Yamaha says its YAS-1600 doesn't need a stand-alone subwoofer. The soundbar has dual built-in subwoofers, twin bass reflex ports, and Advanced Bass Extension Processing for surround playback. In other words, you can get deep, rich bass without a separate outboard subwoofer. Should you want to rock both the house and the neighborhood, however, the YAS-106 does feature a subwoofer output so that you can add a separate powered sub. Modern TVs are terrible at reproducing basic dialog. Dialog intelligibility is a major selling point for soundbars, and Yamaha says that the YAS-106 doesn’t disappoint. With the Yamaha Clear Voice feature enabled, you can raise the dialog levels in the YAS-106 to ensure dialog audibility no matter what’s going on in the background of a scene. The YAS-106 supports HDMI 2.0 connections. While the material provided by Yamaha didn’t explicitly state HDMI 2.0a support, we can infer that to be the case based on the soundbar’s ability to pass through both full HD (1080p) from Blu-ray Disc players and 4K UHD video with high dynamic range (HDR) if connected to compatible UltraHD Blu-ray players or other forthcoming UHD sources. Yamaha did not specify if there would be HDCP support, but we can again infer that the YAS-106 will support HDCP 2.2 for UltraHD/4K copy-protected content. 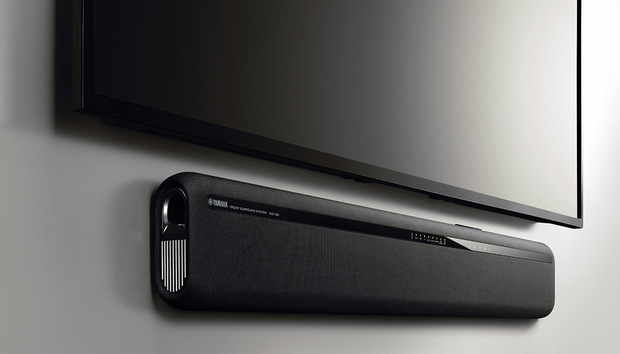 Yamaha’s YAS-106 Soundbar sports a slimmer, rounded styling. There is a single HDMI input and output. Yamaha points out that the HDMI input allows the YAS-106 to get the full multi-channel audio and process it accordingly. Some competitors’ sound bars connect to a TV’s optical digital-audio output and only get a stereo signal instead of the full surround mix. Yamaha’s HDMI implementation supports CEC (Consumer Electronics Control) so that the YAS-106 can be used with other CEC-compliant devices, reducing the need for multiple remote controls..
To top things off, Yamaha’s new soundbar can be controlled wirelessly via Bluetooth on either Android or Apple iOS mobile devices by downloading the free Yamaha Home Theater Controller app. The Yamaha YAS-106 is slated for mid-August availability at $199.95 MSRP.